[/caption] The weather in Central Oregon is summertime at its best. I was amazed at how much water was still in the Central Oregon high desert. The abundant snow and rain fall has caused every single lake, creek and river to swell well over its banks. Almost all of the hiking trails are still covered in snow and I have never seen so many pine trees flooded near the banks of the alpine lakes and rivers. I took this shot while driving on Century drive/Cascade Lakes Highway while returning from Green Lakes. It was about 7:20pm when we noticed these 4 bucks and a single doe grazing in the meadow. The doe was mostly laying in the grass as the 4 bucks crowded around her. I wanted to have Broken Top in the background along with the meadow and the dear in the entire frame so I attached my Sigma 17-70 mm lens and set the focal length at 57mm. Since I was sitting in the backseat I wasn’t able to set up my tripod so I had to try and be as still as possible without blurring the camera. This was especially difficult since it was getting late, the sun was low and I was using my CIR-PL and warming filter. I had the ISO at 100 and the white balance at -2 in order to saturate the landscape. The camera was in Program/Normal mode so the aperture was at F-5.6 and the shutter speed was at 1/128 second. [/caption] Silver Falls State Park or also known as Silver Creek Falls State Park is Oregon’s largest State Park. As far as I’m concerned it should be designated a National Park. I took this photo on 5/7/10 and you can read my extensive article about the Park which I posted on 5/10/10. There are so many awesome waterfalls which are all accessible from the trail head that you could easily spend the entire day photographing them. Normally I will go back to some of the same waterfalls as the sun and shade moves about throughout the day. This is especially true if you are a serious waterfall photographer. This photo was taken around 8:30 am just as the sun was beginning to rise above the forest directly behind the falls. I wanted to have some light in the photo but without washing out the waterfall. However, I was only able to set the shutter priority to .8 seconds due to the intensity of the light. As you can see there was almost no movement showing in the foliage. Normally it can be pretty windy near the falls and the trail head due to the intense force created by the water thundering over the falls. The noise pierces your ears as the water crashes on the massive basalt rocks below. It literally sounds like a constant chain reaction of cars crashing into one another. I tried to keep the glare down as much as possible so I set the ISO at 100 and the white balance at -2. I also used my ND4 filter as well as my warming filter. You could never get this type of shot without either using an ND filter or at least a CIR-PL. I find that using an ND filter when photographing waterfalls is usually the best choice. I was also using my tripod, bubble level and remote switch. These are also a necessity when photographing waterfalls since you will want to get the blur effect while using your shutter mode. 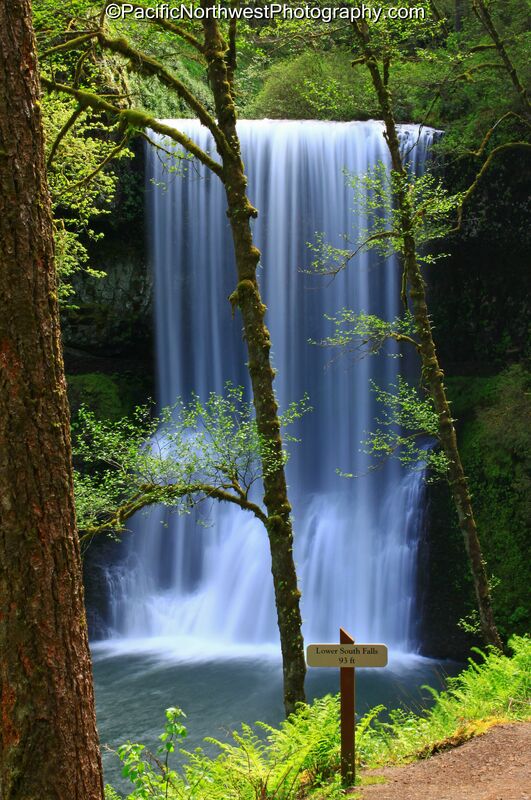 I find that the best time to visit Silver Falls State Park is during Spring and Early Fall. I would also recommend visiting during a weekday since the weekends can get pretty busy. This is especially true if you are wanting to get some photos without people in your waterfall shots as well as having the opportunity to set up your tripod without other hikers having to walk around you. [/caption] I am now starting to look forward to an early spring this year. I have all but lost hope in a snowy and amazing winter in the Northwest as they had predicted. Therefore, I am starting to give my attention to one of the most amazing places to visit during spring and that is the Columbia River Gorge. 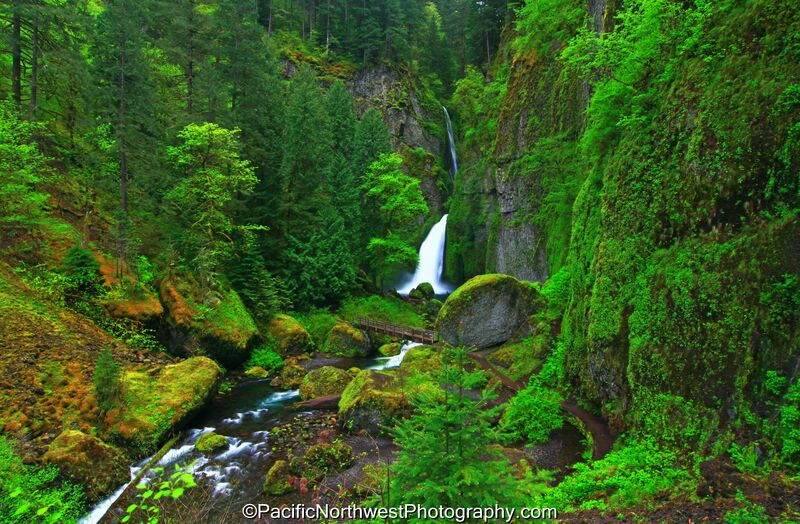 Both Washington and Oregon share in its beauty but the Oregon side has a lot more waterfalls and creeks to hike along. I snapped this photo last spring on 4/30/10 and it was later in the day around 4:15pm. The sun was out for most of the day and there weren’t many clouds to shade the gorge. However, since I waited until later in the day I was able to get this great shot of Tanner Creek with the unbelievable greenery surrounding the creek. However, I was only able to set the shutter speed to 1/2 second due to the light and glare still being created by the fast movement of the water. I was using my Canon EOS T1i along with my 18-55m lens. I set the focal length to 24mm in order to allow the vegetation and rocks to frame the photo. Since I was using shutter mode while in Program the aperture was at F-11. I set the ISO to 100 and the white balance at -0.7 in order to prevent too much glare but still get some of the blur from the movement of the water. I was using my tripod, bubble level and my remote switch as well as attaching my ND4, warming and CIR-PL filter. This allowed even a smaller amount of light to enter the lens. I can’t express how amazing the gorge is during spring. Especially since the snow is melting in the Cascades which creates a thunderous amount of water spilling through the waterfalls and engulfing its creeks. The vegetation explodes with neon greens and the flowers turn to all colors imaginable. Clearly a most epic scene that one must enjoy every year. [/caption] I have now posted my second photo that isn’t of the snow in the Cascades. I am really getting tired of all the rain/snow mix that has been falling in the Cascade mountains. I am beginning to think that this winter is going to be as bad as last years winter. I know that they are predicting the colder temperatures and snow to arrive by next Wednesday but I am starting to lose faith in their predicting ability. We Oregonians know that we normally get a cold snap with some early snow that allows the ski resorts to open but then to be sidelined by a quick and nasty warm and rainy event. However, I thought this winter was supposed to be different. How many times do we need to hear about La Nina. In fact, we usually have sunny but much colder weather in December. This month has turned out to be warm and very rainy. This is nothing like they predicted. I will now stop complaining about our winter in the Pacific Northwest and write a little something about this photo that I took along the Columbia River Gorge on 5/18/10. Last spring was one of the better springs that I have ever experienced in the Northwest. On this day, I was able to take several photos of the many waterfalls that string along the old Columbia Highway. I took this photo at about 6:45 pm. I was heading back from the east side of the gorge when I decided to stop at Lower Latourell Falls. I was pretty sure that I would have a great opportunity to get a good shot since the sun was lowering and the shadows were just starting to appear. I was using my Canon Rebel T1I along with my Canon 18-55mm lens. I also made sure to use my tripod, bubble level and remote switch. Since the sun was still rather bright I attached my ND 4 as well as my warming filter. I was only able to adjust the shutter speed to about 1.3 seconds due to the brightness of the sky. I set the ISO to 100 and the F stop was at F-14. I had the camera mode on shutter and the white balance at -1.3. The Latourell Falls trailhead is one of the closest waterfalls from Portland and it’s a short drive along the Historic Columbia Highway. The hike is about 2.3 miles and it’s a very easy loop to hike. The lower falls is 249 feet and the upper falls is 100 feet. Upper Latourell Falls is about 1 mile from the parking lot and the trail winds around the falls and brings you back to the road which directs you under a really old 100 foot arch that is part of the historic highway. The trail is paved and its a great hike for kids and for taking photos. [/caption] Friday was another great day to view the Falls in and around the Gorge. Most of the vegetation is out but there are still some vegetation that is just not ready yet. However, there were plenty of neon greens to create a great landscape with the creeks and waterfalls in the background. I decided to take as many pictures along the gorge in one day. 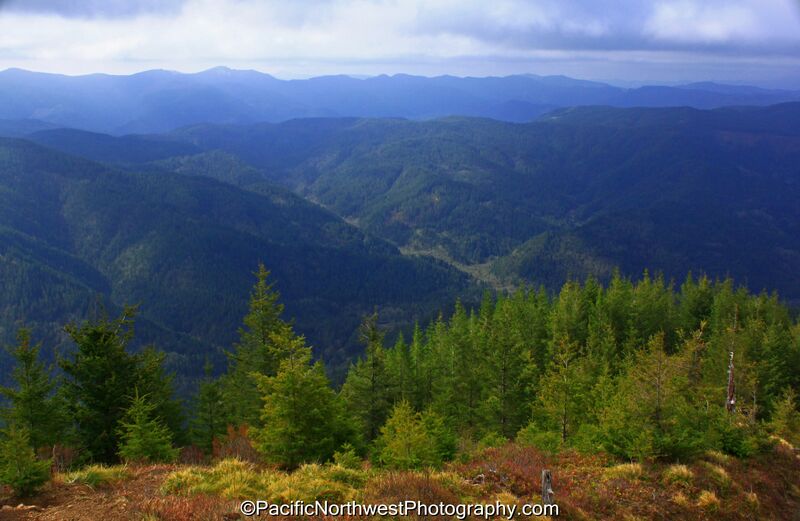 I started my morning atop the Womens Forum State Scenic Viewpoint and eventually finished near Hood River atop Mitchel Point, a grueling but quick hike that overlooks the entire gorge. The day was filled with downpours, wind, sun, sprinkles and cold. The waterfalls are currently so thunderous that it’s almost impossible to get a pictures near the falls without ending up with water spots covering your lens. I was forced to delete most of my photos due to this. I was able to photograph over 10 of the waterfalls and visit three viewpoints that are high above the gorge. I decided to post this picture of Wahclella Falls since it shows just how green the vegetation is and how scenic the gorge is. There were several other smaller waterfalls pouring over the basalt cliffs as I was trying to take this picture high above the basalt grotto. This waterfall is one of the most difficult to photograph due to the speed and strength of the falls. The speed of the water coming out of Wahclella Falls is so great that it’s really hard to get the mirrored effect without distorting the rest of the falls and creek. To get this shot I hiked just above the main trail and used my tripod to steady my camera. The exposure mode was set at auto exposure and the exposure program was set at shutter priority. The shutter was set at .8 seconds and the focal length was set at 15mm. I was using my 12-24 wide angle lens and had attached my warming filter and my CIR-PL. I set the ISO to 100 and the F-stop was set at 18. The rain had just started again when I took this picture. The hike to Wahclella Falls is easy and very scenic. There are hundreds of areas to stop along the creek to take pictures of the vegetation clinging along the creek as well as the many moss covered rocks seemingly floating just above the water.